Mzo is a passionate teacher and choreographer and seasoned performer. He is Artistic Director of Sibonelo Dance Project which he founded in 2008. Mzo trained with Siwela Sonke Dance Theatre where he later became a company member in 1998. Since those early days as an aspirant dancer he has performed choreographed and taught extensively inside and outside of South Africa. He performed at Womad Festival (Frititi, London and Spain), the opening of the Commonwealth Games (Uthingo, London), the inauguration of the Archbishop of Canterbury (Frititi, London), the South African Festival in London and the Ghanian Music Awards (London). Other international performances have included The Jungle Book with Universal Shows (Dubai 2003), the Congo Fespam Festival with Frititi (Congo 2004) and Porgy and Bess with Cape Town Opera (toured the UK in 2009 and Israel in 2010). While at Siwela Sonke he performed many times in works such as Unclenching the Fist, A South African Siddharta (also performed at Grahamstown Festival), NeWorks, Songa Dance Festival (2001 Madagascar), Bewitched, Bothered and Bewildered, Burden of Proof (Phenduka Dance Theatre 2001), Dance and Tell Your Territories (a collaborative work with French artist Anne de Beaufort 2001) and made several performances at the Jomba Festival including Laws of Recall which was also performed at the FNB Vita Dance Umbrella. Gasa was nominated for the FNB Vita dance award for the most promising male dancer several times and won in 1998. He also received an award in 2001 to choreograph his own work (Bond Again) for the FNB Vita Jomba Dance Festival. Mzo has danced and, in some cases, taught and choreographed for the following companies in performances and workshops: Frititi (London, Director – Nii Tagoe), Badejoarts (London, Director – Sir Peter Badejo OBE), Shikisha (London, Director – Julia Mathunjwa), Uthingo (London, Director – Eliot Ngubane), RJC (Leeds, UK), Bullies Ballerinas (London, UK), Kafig (France), Buzz Dance Theatre (Australia), Fantastic Flying Fish Dance Company (Durban, SA), Flatfoot Dance Company (Durban, SA) and Phenduka Dance Company (Durban, SA). He has also taught choreography and dance for Theatre for Africa, primary and high school learners for the Western Cape Department of Education (as dance teacher and artist in residence from 2008 until 2016) and open classes at Dance for All amongst others. Passionate about education, Gasa was a contributor to a South African textbook: Grade 7 Arts & Culture (Maskew, Miller, Longman Kagiso imprint 2004). Sibonelo Dance Project, which he founded and directs, performed at the Fanfest and Bellville Fan Park in Cape Town for the 2010 FIFA Soccer World Cup, at the opening ceremony for the Metropolitan Cup 2010, on the main festival program for the Baxter Dance Festival a number of times, at the Artscape Schools Festival for the past 6 years (where Sibonelo Dance Project has been invited to perform in the final gala concert four times), in the Infecting the City festival, at Jazzart Dance Theatre’s Danscape and Azishe, and at the Joseph Stone Theatre. He also spent time at Jazzart Dance Theatre where he was a company teacher, rehearsal director and resident choreographer. During his time at Jazzart, he choreographed or co-choreographed several productions including Biko's Quest, Destination Lerato and a number of other pieces. Biko’s Quest has toured to the Eastern Cape, the Grahamstown Festival and Mozambique and was invited by Afro Vibes for a tour to the Netherlands and the United Kingdom, as well as being performed for a season at the Soweto Theatre in Johannesburg. He has also choreographed for a full scale collaborative production at the Joseph Stone called ‘Uhambo’, which was well acclaimed and which he also organised and directed. This project was repeated in 2015 and 2016 (Uhambo 2 & 3) and was staged in townships around Cape Town. He was granted MGE funding to produce a full scale production of ‘Ubunye’ which was performed in Langa and Khayelitsha along with dance workshops with local youth. This process resulted in the creation of the Sibonelo Dance Project outreach programme which sees almost 200 children and youth participating in classes at UCT throughout the year on Saturdays. In addition, he still teaches many of these youngsters in Delft, Langa and Khayelitsha during the week. Sibonelo Dance Project has performed at the Infecting the City Festival on a number of occasions, as well as the Baxter Dance Festival and various community festivals and events over the years. In 2016, he choreographed a full length production called ‘Abangabonwa’ which has toured at the Grahamstown National Arts Festival 2016, as well as around the townships of Delft, Nyanga and Khayelitsha. The production won a Standing Ovation Merit Award from the NAF. In 2017, the production was also staged at the Cape Town Fringe Festival and Mzo won a FRESH Creative Award for choreography. In 2018, he produced two new full length productions. Ukuzinza was produced for the Playhouse Company in Durban and got critical acclaim, full audiences and consistent standing ovations. Standing ovations and full audiences were also achieved at the National Arts Festival 2018 in Grahamstown, where he staged Amaqhawe on the main festival programme. I am Nkemiseng Khena, a lady of 25 years old. I was born and raised in Kwamashu, Durban and am currently staying in Cape Town. I'm a freelance professional dancer and dance teacher. I started my dance career at the age of 15 with Phenduka Dance Company’s outreach project ‘Rise and Shine’ directed by Mlekeleli Khuzwayo. I was also trained by Vusi Makhanya at Dusi Dance Company for a year and a half. In 2012, I auditioned and was accepted into a 3 year training program at Jazzart Dance Theatre. While training I performed in Jazzart's Dance Joint and Azishe Festival, I've also been part of works such as 'Destination...Lerato', 'Waiting for Rain ', 'Melting Truth' and did variety of corporate jobs in and around Cape Town, including Infecting The City 'Finding the Other' directed by Nontando Cele. For a period of two years I worked with Bongi Dube (musician) as her dancer and toured South Africa and Swaziland. I have worked with the legend, Mbongeni Ngema, in a musical production, ‘Isitimela’, and had the opportunity to work with him once again for the ‘Siyagiya Festival’, a music and cultural festival in KZN. I have recently done performances with The Handspring Puppet Company performing abstracts from ‘Warhorse’ around Cape Town, in Dubai and Switzerland(Basel Tatoo). I have performed 'Ubunye', a one hour dance production as a township tour and 'Ababhidisi' (Baxter Dance Festival), 'Going Places' (Infecting the City Festival), all choreographed by Mzokuthula Gasa. I also performed in the full production 'Kugqityiwe Intando' at the Artscape Theatre under direction of Mandla Mbothwe, choreographed by Mzokuthula Gasa. I believe that, as an artist, I need to be versatile. I am not just a dancer, I am an artist and am always willing and eager to learn more to improve my craft. Sinazo Bokolo-Bruns was born and raised in Johannesburg but originally from eCofimvaba a small town in the Eastern Cape. She attended Fairways Primary School followed by the Micheal Mount Waldorf School. She trained with the Ballet Theatre Afrikan Dance Academy with Martin Schoenberg for 5 years and was strictly trained in ballet. She then ventured off to Moving into Dance and was introduced to Contemporary African Dance . At the age of 17 she moved to Cape Town where she then attended the JAZZART Dance Joint classes and then auditioned to being accepted into the Jazzart Dance Theatre’s three-year Training and Job Creation Program. There, she was Introduced to many different genres of dance such as Gumboot, Tap, Indian, Salsa, Pantsula and Hip Hop. Sinazo was then accepted as part of the Jazzart professional company and stayed on for two years. She is currently working with Sibonelo Dance Project directed by Mzo Gasa. This is where she has gotten in touch with her African Dance and is there as a company member and outreach teacher. She is also very much a freelance artist. Within her years of training she has attended many workshops within and out of South Africa broadening her artistry and wanting to constantly push her boundaries. She forever wants to learn and give back to disadvantaged communities. I'm Nkosinathi Sandile Mngomezulu, a self-motivated person who loves life. My career started at the early age of seven at the local township hall. I used to dance Pantsula with a group of four as well as a local dance group of five. I danced for these groups until I had the privilege of dancing for our former president, Nelson Mandela, at the King Park Stadium which now is known as Moses Mabida stadium. My love of dance grew much stronger and I decided to go for training. I went to Phenduka dance theatre and I trained with them for two and half years. I had the privilege of travelling to other provinces while I was with Phenduka dance theatre. I then decided to go the extra mile to join Jazzart training program for three years and I did Azishe, Waiting for Rain and Destination Lerato. After all that, I went to join Sibonelo Dance Project to gain knowledge of teaching as well as choreographing. I got the opportunity to do Warhorse puppet show which has been touring to Dubai and Switzerland, plus another puppet show called Fire Bird which is also touring to the UK. When he was in grade 10 he chose drama and dance as a subject. One of his strongest was dance. He was involved in many school productions where he started to perform in theatres such as ARTSCAPE, BAXTER and FUGART THEATRE and he was in involved in a number of festivals such as YES (Youth Environmental School Festival), where he attended workshops and learnt more about art in South Africa. He matriculated from Chris Hani High School in Khayelitsha, Cape Town and became the director of one of the community groups in the area. In 2012 he went on to study a Dance Teaching Diploma at the University of Cape Town, including African instruments on the Music campus. While he was studying he was involved in lot of school productions and in second year he signed with an agency ( MAMA DANCE AGENCY, directed by Jackie Job)(EXPRESS DANCE AGENCY, by DEBBY). Finally, in his last year he performed for UNI GLOBAL WOMENS CONFERENCE which was directed by Mpho Kunene and he got a solo in gumboot dance. 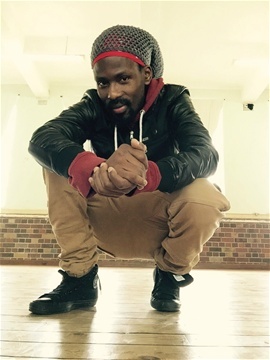 In 2014 he join a group from Langa which is Isingqi se Afrika for which he Choreographed and taught the group. He graduated in Dance Teaching Education from the University of Cape Town Dance school at the end of 2014. In 2015 he started working for Sibonelo Dance Project which is directed by Mzokuthula Gasa and as part of the Company he did a lot of shows in ArtsCape Theatre and around the townships. Also, he was involved in Jazzart Dance Theatre Company for which he was doing Dance lab, in this dance lab. He had a chance to work with Mandla Mbothwe and Mamela Nyamza. He went with Underground Dance Thetare to perform a production called BOK in the National Arts Festival in 2015 and came back to perform it in the University of Cape Town dance school for Confluences 8. Thembekile Komani trained with New Africa Theatre Academy. During the course of his training, he did a number of productions such as 'The Suit' directed by Mbulelo Grootboom. After graduating at NATA, he went to study at Magnet Theatre, training under Jenny Reznek and Mandla Mbothwe, performed in numerous productions as part of the training programme - Inxeba Lomphilisi (The Wound of a Healer), Amanzi Othando ( Waters of Love) directed by Mandla Mbothwe and Children and the Bees directed by Mark Fleishman. After graduating at Magnet, he went to explore the dance world and was accepted as a trainee in dance at Jazzart Dance Theatre, where he featured in shows such as, Destination...Lerato directed by Ina Wichterich, Waiting for Rain directed by Jackie Manyaapelo and Unlimited choreographed and directed by Mziyanda Mancam. 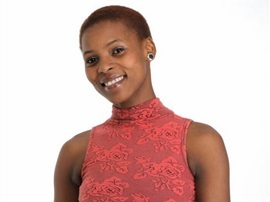 Thembekile is now working as a freelance performer. He has done enormously well both in theatre and film. He has featured in an international series "Book of Negroes" by film company 'OUT OF AFRICA' and The Trail by Narrative Truth directed by Bauke Brouwer. In theatre, we have seen him in Balbesit written by Saartjie Botha and directed by Jaco Bouwer, Biko's Quest directed by Mandla Mbothwe and choreographed by Mzo Gasa, Death the Redeemer by Lwanda Sindaphi, Ababhidisi, Ubunye and Going places all choreographed and directed by Mzokuthula Gasa. Thembekile was part of Warhorse during his engagement with the Handspring Puppet Company, doing the promo show of Warhorse all around SA. For the love of his art, Thembekile refers to himself as "slave 2 da Arts, and soldier at heart". I am Lusanda Lucia DAYIMANI, 26 years of age. I was born and bred under this big beautiful blue clear sky. I'm originally from the Eastern Cape, Queenstown. My artistry started at a very young age when I was involved in a community organisation called Iqhude Theatre Organisations which was formed by Thembelihle Mananga. I continued performing around Khayelitsha and in Cape Town as a whole as well as in schools. The organisation was also involved in the Khayelitsha Youth Forum and Magnet Theatre interventions. I then realised that performing arts was a career to me. After my high school, I went all out to pursue my dream of being a performer. I studied at New Africa Theatre Academy in 2009 & graduated there. In 2010 I went to Magnet Theatre and trained there for 2 years. I did a number of performances while there and graduated in 2011. In 2012 I thought of exploring and expanding my career in various ways to develop a unique language for me as an individual. I went to train at Jazzart Dance Theatre for 3 years and also performed with them in a number of performances. Recently I have joined Sibonelo Dance Project where I have been given a platform to express my core, to elaborate on my strongest points and strengthen my weaknesses. Where I've been given a space to share my knowledge and pass it to the upcoming generation. Sibonelo was given birth by Mzokuthula Gasa who had a vision to help young artists create jobs and help them spread their wings and fly.